Vandenberg is considered the mostly likely primary landing site for X-37B. Edwards Air Force Base, also in California, serves as a backup landing strip. This second flight of the winged X-37B space plane design began with a launch on March 5, 2011. It was lofted into Earth orbit by an Atlas 5 booster from Cape Canaveral Air Force Station in Florida. The space plane now circling Earth is the second spacecraft of its kind built for the Air Force by Boeing’s Phantom Works. What payload the X-37B is carrying is classified, and the mission is being carried out by the Air Force Rapid Capabilities Office. Each X-37B space plane is about 29 feet (8.8 meters) long and 15 feet (4.5 m) wide. The vehicle has a payload bay about the size of a pickup truck bed and is outfitted with a deployable solar panel to generate power. In an earlier email message, U.S. Air Force Maj. Tracy Bunko, the Pentagon's spokesperson for the X-37B project, told SPACE.com that a third flight of an X-37B spacecraft — slated for liftoff this fall — will use the same craft that flew the first test flight, the OTV-1 mission, in 2010. The first voyage of the X-37B space plane launched into orbit on April 22, 2010, and lasted 225 days. That craft landed on Dec. 3, zooming in on autopilot over the Pacific Ocean and gliding down onto a specially prepared runway at Vandenberg. 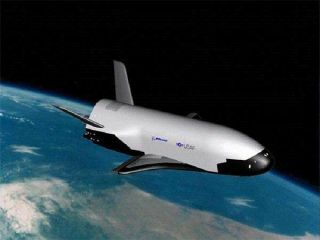 According to General William Shelton, commander of Air Force Space Command, the current mission of high-flying X-37B space plane has been a huge success. Speaking April 17 at the 28th National Space Symposium in Colorado Springs, Colo., Shelton said: "Although I can’t talk about mission specifics, suffice it to say this mission has been a spectacular success." Shelton praised the long-duration mission of the craft, which far surpasses its 270-day baseline design specifications. According to an Air Force fact sheet on the vehicle: "The X-37B Orbital Test Vehicle, or OTV, is a non-operational system that will demonstrate a reliable, reusable, unmanned space test platform for the U.S. Air Force. The objectives of the OTV program include space experimentation, risk reduction and a concept of operations development for reusable space vehicle technologies."